For the 24 hours to 23:00 GMT, the EUR rose 0.52% against the USD and closed at 1.1690. The European Central Bank (ECB), at its September monetary policy meeting, decided to keep the benchmark interest rate steady at 0.00%. Further, the policymakers reiterated that the bond purchasing will be lowered to €15 billion per month from October until the end of December. Meanwhile, the ECB cut its growth forecasts for the euro-area. The bank now expects growth of 2.0% in 2018 and 1.8% in 2019, slightly lower than its previous forecast of 2.1% and 1.9%. In a statement post-meeting, the ECB President, Mario Draghi, warned that uncertainties relating to protectionism and international trade tensions weigh down the economic expansion and could impact global economy. The US dollar fell against the EUR, following weaker than expected US inflation data. In the US, data showed that the consumer price index rose less-than-expected to 2.7% on an annual basis in August, compared to a rise of 2.9% in the previous month. Market participants had anticipated the index to climb 2.8%. Moreover, seasonally adjusted initial jobless claims unexpectedly declined to 204.0K, compared to market consensus for an advance to 210.0K. In the previous week, initial jobless claims had registered a revised level of 205.0K. Meanwhile, average weekly earnings rose 0.5% on an annual basis in August, compared to an advance of 0.1% in the previous month. In the Asian session, at GMT0300, the pair is trading at 1.1694, with the EUR trading a tad higher against the USD from yesterday’s close. 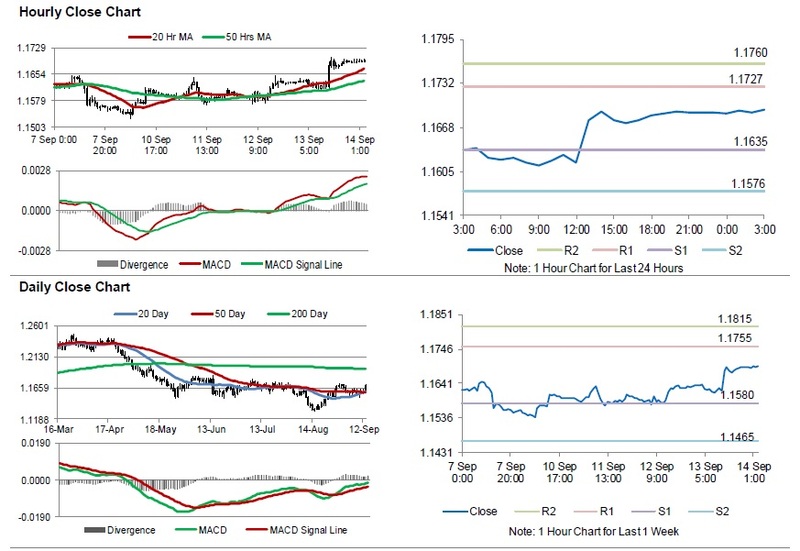 The pair is expected to find support at 1.1635, and a fall through could take it to the next support level of 1.1576. The pair is expected to find its first resistance at 1.1727, and a rise through could take it to the next resistance level of 1.1760. Trading trend in the Euro today is expected to be determined by the Euro-zone’s trade balance data for July, scheduled to release in a few hours. Later in the day, the US advance retail sales, manufacturing and industrial production, all for August, will pique investors attention. Additionally, the US business inventories for July and the Michigan consumer sentiment index for September, will be on investors radar.